Back in the “olden days” of photography, a good photographer would spend a long time setting up a shot, picking the right filters, adjusting for light and then finally taking a set of photos which he or she wouldn’t actually get to see until a few hours later in the dark room. A professional set-up included a number of cameras together with all the kit required to develop the photographs themselves. Any effects that were required got added either before the photo was taken or afterwards using a range of techniques and chemicals to bring out a different light, add vignette and a whole range of fancy ways to alter the finished product. It took skill and above all, it took time. This was a barrier to many – learning the skills, getting the equipment and building a dark room wasn’t really in a hobbyist’s budget. Obviously they could send their film off to be processed but this meant that for many, photography was really down to holiday snaps and the odd arty shot on the beach when you could get the lighting “just right”. These days things couldn’t be more different. DSLRs mean quality photography is available to anyone with a few hundred pounds in their pocket and the results are instant. You can take a number of shots and flick through them on a screen straight away while deciding whether to keep or delete and on some cameras you can also add filters such as black and white, sepia and others in the blink of an eye. And then when you get back home, you upload your images to your computer and manipulate them with PhotoShop. It’s all so easy! And of course, we now have Instagram which doesn’t even require any thought because they’ve taken an “all-or-nothing” approach to filters by offering you a range of different styles you can apply to your pictures while still on the phone. Take a picture of your child on the park swings, apply a vintage filter and you’ve immediately got a photo that looks like it was taken in the 70s and this is why it appeals so much to people. It’s instant nostalgia, taking people back to a time when things were better (whether they actually were or not) and making every picture look like it was taken on a sunny day during one of those summers that seemed to last all year. The jury is out on whether this is a good thing. 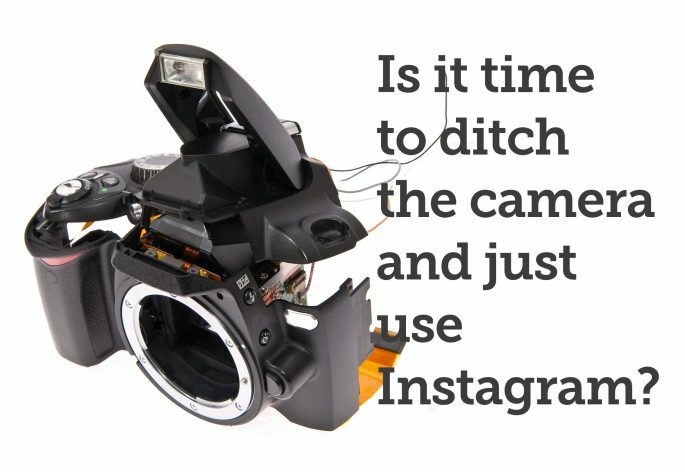 Instagram has obviously got more people interested in photography and you’d hope that this would extend to people looking into having more control over the results and maybe, just maybe picking up a DSLR and having a go themselves. Obviously some people are dead against it, saying that it cheapens the profession, devaluing the art of the real photographer, but surely anything that means people will take photos is, eventually, a good thing for the industry?